Start the parade! Even very young musicians can shake, rattle, and thump these easy-to-handle toy instruments, and it's a joy kids never outgrow. Bug-themed music set includes kids' marching drum, centipede drumsticks, jingle bell ant, busy bee maraca/clacker, caterpillar tambourine, and two shaka-shaka eggs. A fun way to develop music and motor skills. 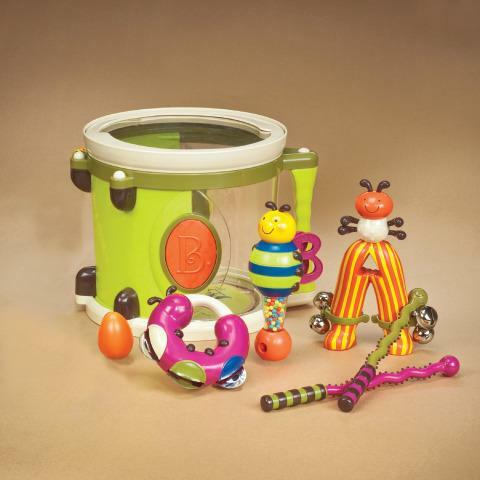 Toy drum has a handle and breakaway strap, so kids can march around with it. Eight-piece first instrument set includes: drum, 2 drum sticks, jingle bell, clacker, tambourine and 2 shaka-shaka eggs.